We can help you read the code of your key if you send us a clear photograph of the tip of your key - we'll need at least two images one taken at 45 degrees to the other.- images are best taken against a neutral background not on a white paper. Note - information is for 8 cut keys to year 1997 (not a six cut keys) they are not interchangeable and you may harm you locks if you try the incorrect key. If you own a car later car (Chips were used in keys 1998-1999 that can be cloned - we do offer ths service but will need your original key, 2000+ later cars used rolling codes that must be set by your dealer) this is not the key for your car. We also offer a key cutting service for 6 bit keys purchased elsewere - you'll need to send us a new blade (available from Jaguar) and the correct code for us to be able to program our cutter. Call for details. However reading the code yourself is pretty easy and will take just a few minutes a pencil and a piece of paper. Your keys code will consist of 8 numbers each representing the angle of cut. Starting from the end furthest away from the tip. Write down the number of the first angle. No cut is a #1, mid level cut is a #2, #3 will be a cut almost to the center flange. Continue until you get to the tip. Check a second time - you should have a string of numbers that represents the code that looks like this 2-2-3-1-1-2-3-2 or similar. Sometimes adjacent angles will be the same and will be represented by two numbers being the same. 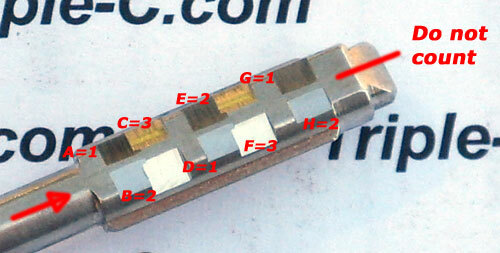 The image below is a typical key. Take a few minutes to read the code. You should come up with 1-2-3-1-2-3-1-2. To order a blank 8 cut Jaguar Tibbe key . To order a cut to code 8 cut Jaguar Tibbe key. - Still having a problem reading your keys code - give us a call. 2000 or later Jaguar with 8 cut or 6 cut keys we can still help - though we do not carry these keys (they are often sold on eBay). We do not supply 2000 and later keys you'll have to purchase your self and mail to us - however we can cut the key for you on our Tibbe cutting equipment. You'll need to supply key blank (not in a shell) along with "T" code - call for details of this service. This Jaguar bulletin will help you understand how a Tibbe lock is constructed and how it can be re-coded.